English convert to Christianity; born in 1801; died at Strasburg, Alsace, Jan. 28, 1864. At first a preacher in the synagogue at Bedford, he became converted to Christianity and was ordained in 1839 as a literate in the Church of England, and afterward he became traveling secretary to the London Society for Promoting Christianity Among the Jews. From 1847 to 1856 he acted as chaplain to Chester Castle. 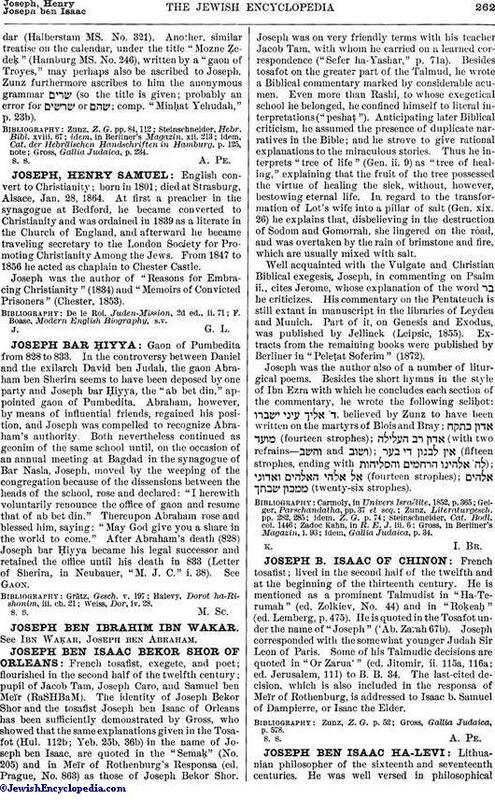 Joseph was the author of "Reasons for Embracing Christianity" (1834) and "Memoirs of Convicted Prisoners" (Chester, 1853). F. Boase, Modern English Biography, s.v.